I'm FINALLY back in the kitchen! Actually it's not like I ever really left. You know how it is - we can have 500 projects going all at the same time but still need to get the laundry done and dinner on the table, right? I did tell my family no-one was allowed to open the drapes - this way I couldn't see the one inch high dust covering every flat surface in my house. My usual response? "Go light some candles...let's pretend it's still the middle of winter"
Anyway, these last couple months have been nuts with RenFaire prep - more to come on that later - so food items have needed to be quick and easy and NO fuss - last night was hot dogs - yes...I'm serious...and I'm just fine with announcing I made boiled hot dogs to the entire world - boiled! I didn't even bother to go turn on the grill. I like my pasta with just olive oil, fresh parmesan and some fresh ground pepper and whatever else I'm in the mood for. So this dish is perfect for me and came together pretty quick. Very happy with my lunch today. I say this here because I ALWAYS seem to forget to do this until right before I need it. Grab one of those disposable aluminum trays or some other grill safe pan. Cut the butter into 8 pieces. 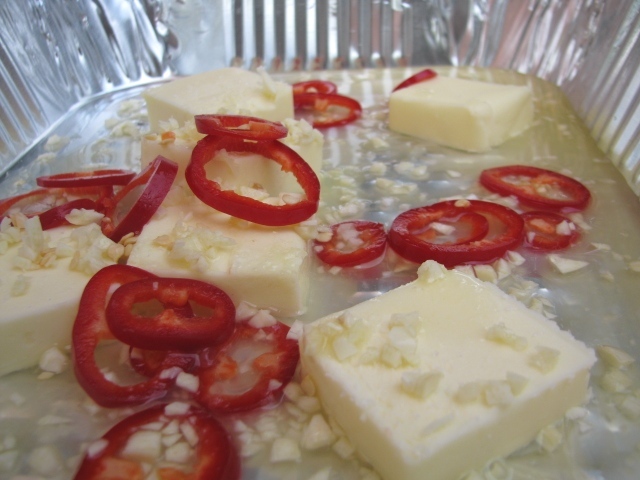 Add the butter, garlic, olive oil, and lemon juice to the pan. Thinly slice the red pepper and add that in. Add a few turns of pepper. Then swish all of that around a little - set aside. You want to make sure that pepper infuses everything in that pan. Kind of share the heat if you will. Bring a pot of water to boiling. 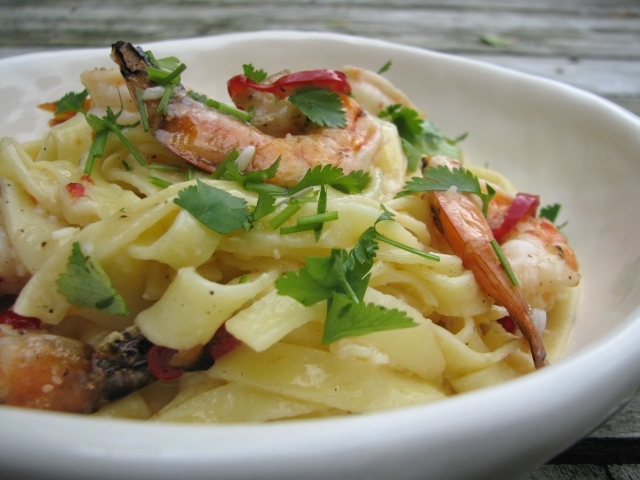 While you're waiting for the water, prep your shrimp and skewer them. Drizzle each side with olive oil and salt and pepper. These next two steps can be done in reverse order I think. 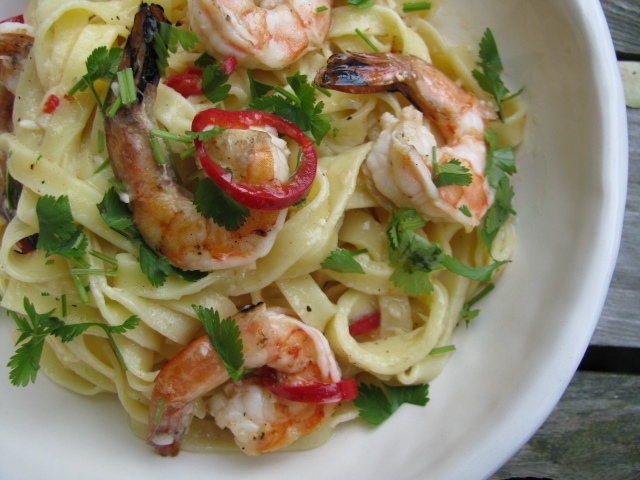 I cooked my pasta according to the package directions - minus a minute so it wasn't mushy, drained it, put it back in the pot, tossed with a little olive oil then went and grilled the shrimp. I'm sure either way will be fine. The shrimp needs to go on the grill for only a couple of minutes on each side. 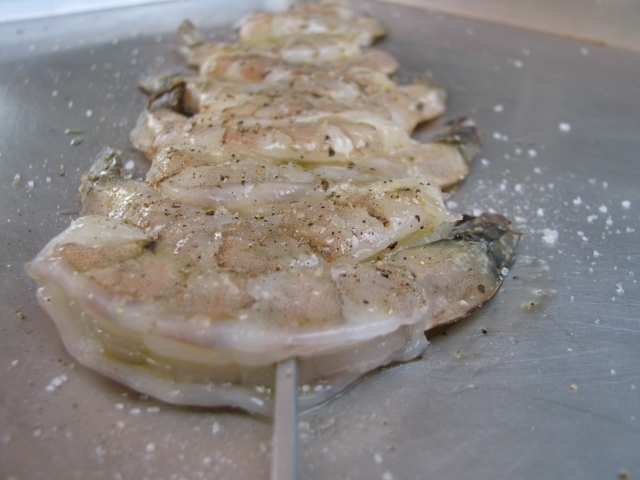 Place the aluminum pan on one side of the grill and the shrimp skewers on the other. Once the shrimp are almost completely done slide them off the skewers into the butter, lemon juice mixture and let cook another minute or so. When ready pour the contents of the aluminum pan into the pot with the pasta and give it all a good tossing. Squeeze a little more lemon juice in there. Add a couple tablespoons of cilantro. Add some pepper and cheese if you so desire. By the way, I think this would be wonderful with brown rice or even some Asian noodles. I just didn't have any today. I made this last night for my husband and he says it's better with angel hair pasta.